There's certainly more than meets the eye with this toy Sega Genesis. To mark the release of Nintendo 3DS title Sega 3D Re-issued Archives, the game maker is giving away this special "Gold version" Mega Drive (aka Genesis) Megatron Transformer to five lucky individuals in Japan. Of course, it's not made of actual gold, but it's gold colored. As pointed out on Famitsu, this version is obviously different from the version currently on sale in Japan. If you look closely at the retail version, you'll see that there is a Sonic the Hedgehog cartridge in Megatron's chest. For the special Gold version, there is a Streets of Rage (aka Bare Knuckle in Japan) cart. The regular Mega Drive Megatron is going for 10,000 yen (US$83). 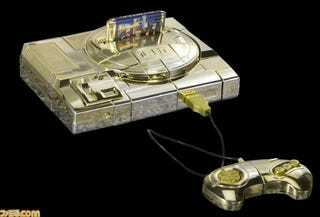 I can imagine that if any of these five lucky winners decided to sell their Gold Mega Drive Megatron, they'd get more. Much more.